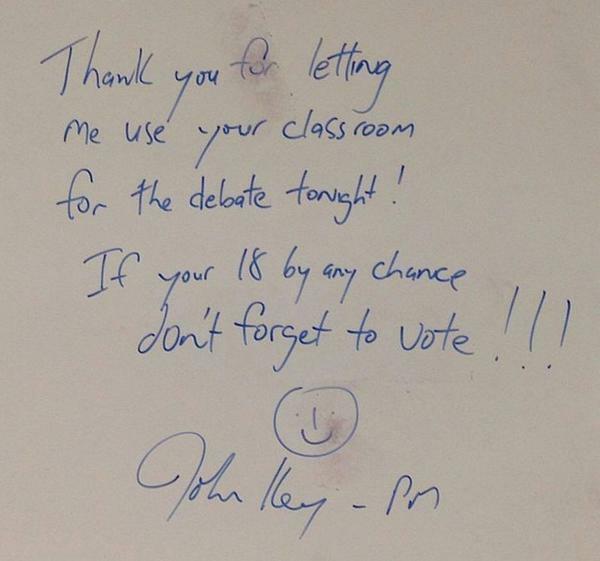 Prime Minister John Key wrote a note to the students of St Margaret’s school in Christchurch thanking them for hosting the recent leaders debate. Some bright spark posted it on Facebook and it was copied to Twitter. It has now gone viral. The New Zealand students were consistently at about the same level as the ESL (English as a Secondary Language) students of Australia. Many of the Australian students, even as low as year 10, had language skills ABOVE the UNIVERSITY students of New Zealand. My kid went back to visit Kiwi relatives not long ago, and a 13-year-old friend of his that he’d stayed with while visiting had never even heard of long division. They were already doing algebra math stories and factoring here where I live now (NOT IN NZ THANK THE LORD) in 5th grade. This despite the fact that his Kiwi relatives insist that Kiwi schools hammer their kids academically. Nothing I ever, ever saw over there when we lived in that country indicated that Kiwi schools produced a generally well-educated product. The dropout rates of Maoris were high. They passed kids on up even if they could not do the work of the previous grade. The ones I met who had good English and math were the result of a family culture that promoted learning, and a natural autodidactic inclination. Nothing to do with the schools they went to. I take the photo as an object lesson in the “exceptionalism” when it comes to Kiwis getting their grasp and use of English assessed. I’m pretty sure John Key didn’t sit for his IELTS or any other English language test for that matter.